Alo was disbarred by default. He failed to participate in the disciplinary proceeding in which he was charged with five counts of misconduct stemming from two correlated matters. The State Bar Court judge determined Alo had received adequate legal notice of the matter. He was found culpable of all counts charged: failing to maintain client funds in trust, failing to respond to reasonable client inquiries, failing to cooperate in the State Bar's investigation of the wrongdoing alleged, and misappropriating client funds for his own purposes--misconduct involving moral turpitude. He was also found culpable of failing to comply with nine conditions imposed in an earlier disciplinary probation order. Alo had one prior record of discipline. Edwards was disbarred by default after she failed to appear, either in person or through counsel, at her disciplinary proceeding, despite having adequate notice and opportunity to do so. She did not move to have the default order entered against her set aside or vacated. She was found culpable of two counts of professional misconduct: commingling personal funds with client funds in her client trust account and failing to participate in the State Bar's investigation of the wrongdoing alleged. Foster was disbarred by default after failing to participate in her disciplinary proceeding. She had actual notice of the matter and had appeared and participated by phone at an initial status conference, but she did not file a response to the Notice of Disciplinary Charges. She did not seek to have the default set aside or vacated. The Supreme Court of North Dakota ordered her disbarred in that state after she stipulated to professional misconduct related to 32 matters there. The next month, the North Dakota court again ordered Foster disbarred upon finding she had committed additional professional misconduct in that jurisdiction. The California State Bar Court judge, in recommending Foster must also be disbarred in this state, found that the record of discipline in the North Dakota proceeding was conclusive evidence of her culpability of misconduct in California. Hayward was disbarred by default after being charged with failing to comply with numerous conditions of a disciplinary probation imposed earlier. He then failed to participate in the instant disciplinary proceeding, despite having adequate notice and opportunity to do so, and a default order was entered against him. He was found culpable of failing to schedule an initial meeting with the Office of Probation, failing to submit a required medical form, failing to provide proof of a treating psychiatrist's evaluation and waiver, and failing to submit three quarterly written reports as well as three mental health reports. Hayward had been disciplined by the State Bar for professional misconduct twice before. Hutchens was disbarred by default after failing to participate in his disciplinary proceeding, despite having adequate notice and opportunity to do so. He was found culpable of seven counts of professional misconduct related to a single client matter: failing to perform legal services with competence, charging and collecting an illegal fee, improperly withdrawing from employment, inducing a client to entrust him with funds based on false pretenses--wrongdoing involving moral turpitude, two counts of failing to comply with court orders, and failing to cooperate in the State Bar's disciplinary investigation. When the recommendation of disbarment was issued, there were three non-public disciplinary matters and one unpaid Client Security Fund claim pending against Hutchens. Kelly was disbarred by default after he failed to appear, either in person or through counsel, at his disciplinary proceeding. The State Bar Court judge determined he had received adequate legal notice, and did not move to have the default order entered set aside or vacated. He was found culpable of four of the five counts charged--all related to a single client matter. The wrongdoing included: failing to render an appropriate accounting of client funds, failing to refund an unearned advanced fee, failing to respond to reasonable client inquiries, and failing to cooperate in the State Bar's investigation of the wrongdoing alleged. When the disbarment recommendation was made, there were two additional disciplinary investigations pending against Kelly. Kop was disbarred after he stipulated to failing to file a timely declaration of compliance as a California Supreme Court directed in an earlier discipline order (Cal. Rules of Ct., Rule 9.20). He had filed a declaration one day late that was rejected as non-compliant because it included conflicting responses; the compliant declaration he ultimately filed was 104 days after the stated due date. In aggravation, Kop had three prior records of discipline. In mitigation, he entered into a prefiling stipulation acknowledging his misconduct, saving the State Bar significant resources and time. In a separate proceeding, Kop was suspended from practicing law, effective December 10, 2018, pending proof of passing the Multistate Professional Responsibility Exam. He had failed to submit the requisite proof within the time prescribed by the California Supreme Court. Nichols was disbarred after being found culpable of four counts of professional misconduct related to two client matters, as well as an additional count for numerous violations of probation conditions imposed in an earlier disciplinary order. Four of the nine counts originally charged were dismissed as duplicative or unsupported by the evidence presented. In addition to violating probations conditions, he was found culpable of failing to communicate case development to a client, failing to promptly pay the client funds, and two counts of misappropriating client funds for his own use--an act involving moral turpitude. 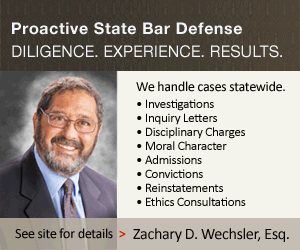 In one client matter, Nichols was hired to represent a client pursing a personal injury case. After receiving no communication about the case for approximately 10 months, the client was told Nichols could not work on the case "due to family issues." Despite this communication, however, he did work on the case--ultimately securing a $3,300 settlement, which the client agreed to split three ways with him and medical provider. Nichols received a settlement check and deposited it in his client trust account. Bank records showed he routinely made small withdrawals from the account by writing checks to himself. Because the Office of Chief Trial Counsel of the State Bar failed to provide an analysis of the withdrawals, the court undertook an independent review of eight months of bank records; it uncovered 82 such small withdrawals, as well as an impermissibly low balance in the account. The second case also involved a personal injury client, with the case settling in about a year for $12,000. Again, he deposited the settlement proceeds in his client trust account, but failed to pay the portion due to various medical providers, causing them to refer the accounts to collections agencies. Nichols sent the client an accounting and share of the settlement proceeds by check about 20 months after receiving them; the checks were returned for insufficient funds. Nichols stipulated that the account balance dipped below permissible levels numerous times during that period. In addition, Nichols was found culpable of violating conditions of his probation--including failing to schedule an initial meeting with the Office of Probation, failing to file written quarterly reports and a final report, and failing to provide proof of attending the State bar Ethics School and passing its final exam. In aggravation, Nichols significantly harmed his client, failed to make restitution, and had a prior record of discipline--the weight of that moderately diminished because the misconduct in the prior and instant matters occurred during the same period. In mitigation, he entered into a stipulation acknowledging some of his misconduct. Ozols was disbarred by default after failing to participate in her disciplinary proceeding, either in person or through counsel, despite receiving adequate notice and opportunity to do so. When contacted by phone by the State Bar counsel, she requested that he "stop bugging her" and added that she didn't want to be an attorney and was planning to move from California. Upon entry of the default order, the factual allegations in the Notice of Disciplinary Charges were deemed admitted and taken as true. Richards was summarily disbarred following the finality of his convictions of a number of felony offenses--including making a false statement to a branch of government (18 U.S.C. §1001(a)(2)), mail and wire fraud (18 U.S.C. §1341), acting as the principal to the crime of aiding and abetting (18 U.S.C. §2), extortion (18 U.S.C. §1951(a)), and money laundering (18 U.S.C. §1956(a)(1)(A)(i)). All the offenses involved moral turpitude as a matter of law. Walch was disbarred by default after he failed to participate, either in person or through counsel, in his disciplinary proceeding. He did not move to have the default order entered set aside or vacated. He was found culpable of the single count with which he was charged: failing to comply with conditions of probation imposed in an earlier discipline order. Specifically, he failed to schedule a meeting with his probation deputy, failed to file his first quarterly written report with the Office of Probation, and failed to make and provide proof of making restitution payments as mandated. Walch had been disciplined by the State Bar for professional misconduct on three previous occasions. Wilson was disbarred by default. Despite receiving adequate legal notice, he did not participate in the disciplinary proceeding at which he was charged with failing to comply with conditions attached to a prior public reproval. He did not seek to have the default order entered against him set aside or vacated. Wilson had one prior record of discipline. When the disbarment recommendation was made in the instant case, there was one disciplinary matter and two investigations pending against him. Arrendondo was suspended from the practice of law for 60 days and placed on probation for two years after he stipulated to committing five acts of professional misconduct related to two clients. The wrongdoing included: failing to practice law with competence, improperly withdrawing from employment, failing to obtain the written consent of two clients with potentially adverse interests before representing them, failing to keep a client reasonably informed of significant case developments, and failing to render an appropriate accounting to a client. In the first matter, Arrendondo represented two co-defendants in connection with their petitions for writs of habeas corpus--failing to procure a written waiver from either one of them due to the potential conflict of interest. In one case, he sought five extensions of time to file an opening brief, but ultimately never filed one; that appeal was dismissed, though he did not inform the client. He later sent the client a substitution of attorney form, urging the defendant to substitute in pro se. In the second case, Arrendondo was paid a fee of $1,300 to represent a client charged with grand theft. After the client hired new counsel about 17 months later, Arrendondo failed to provide him with an accounting of the funds he had advanced. In aggravation, Arrendondo committed multiple acts of wrongdoing that harmed both his clients and the administration of justice. He also had a prior record of discipline. In mitigation, he entered into a pretrial stipulation. Bardellini was suspended from practicing law for 30 days and placed on probation for two years following a reproval violation proceeding. The State Bar Court judge found he was culpable, by clear and convincing evidence, of violating two separate conditions attached to a private reproval imposed on him in 2016. Specifically, he failed to submit his first quarterly written report with the Office of Probation by its due date; he filed it 90 days late. He also failed to take and pass the Multistate Professional Responsibility Exam within one year of the effective date of his private reproval as specified. The judge rejected Bardellini's argument that he was never advised of his right to seek an extension of time or to modify his reproval conditions, underscoring that the Office of Probation repeatedly notified him of the procedure--even citing the specific Rules of Procedure governing such requests. In aggravation, Bardellini had a previous record of discipline--the private reproval imposed earlier. His request for mitigation credit for suffering emotional difficulties was rejected as unsubstantiated, as well as his claim that he missed the filing deadline because he is a busy sole practitioner without clerical support. Besneatte was suspended from the practice of law for 90 days and placed on probation for one year following a contested, original disciplinary proceeding. He was found culpable of two counts of professional misconduct: disobeying court orders and making misrepresentations to a judge--wrongdoing involving moral turpitude. In the underlying matter, Besneatte was hired to represent a client facing criminal DUI charges. On the date the case was set for trial, however, he had another "no time waiver" case to handle, and did not inform his client of the need to appear, since he reasoned he would be granted a continuance. When the judge inquired about the client's absence, Besneatte told her the client had sent him an email stating that his wife was suffering from internal bleeding had to be rushed her to the hospital. On three separate occasions, the judge ordered Besneatte to provide evidence of the alleged medical emergency. He did not. The client was eventually arrested, extradited, and convicted on all counts with which he was charged. During the hearing, Besneatte testified that he did receive an email from the client indicating he had to rush his wife to the hospital. The State Bar Court judge did not find that evidence credible, however, as no email or other communication was produced indicating the emergency. In aggravation, Besneatte committed multiple acts of discipline and had a prior record of discipline. In addition, the State Bar Court judge assign significant aggravating weight to Besneatte's lack of insight for blaming others for his own ethical shortcomings, making him "an ongoing danger to the public and legal profession." He had blamed the client for failing to provide the requested proof and maligned him with various epithets, called the State Bar counsel "unethical and dishonest," and alleged the court was "biased and prejudiced." Cambridge was suspended from practicing law for one year and placed on probation for five years after he stipulated to committing six acts of professional misconduct related to a single client matter. Specifically, he was culpable of failing to perform legal services with competence, failing to promptly return the client's papers and property, failing to refund unearned advanced fees, failing to render an accounting of the client's funds, failing to keep the client reasonably informed of significant case developments, and failing to cooperate in the State Bar's investigation of the wrongdoing alleged. Cambridge was hired to defend a client whose power of attorney had been revoked after a sibling squabble over conservatorship of their father. A superior court had also granted the petitions for breach of fiduciary duties and surcharge filed against the client, ordering her to pay $39,000 and court costs. Cambridge filed a motion to set aside the judgment and an opposition to the motion for attorney's fees and costs; however, neither was successful. Cambridge then contracted with the client to handle the appeal--for a flat fixed fee of $15,000--with costs and expenses to be charged separately. She paid in three equal installments. He filed an initial appeal, which was ultimately dismissed as not accompanied by a filing fee or application for waiver of court fees. The dismissal order was vacated after Cambridge paid the $100 filing fee. He then sought an extension of time to file the opening appellate brief, but did not inform the client, who learned of the due date by calling the court clerk herself. Cambridge's opening brief was ultimately rejected for non-conformity, as it failed to include the requisite table of contents, references to the records, certificate of word count, and bookmarks. The appeal was dismissed, though the court vacated that dismissal--ordering Cambridge to file the opening brief within 15 days. After he failed to do so, the appeal was dismissed for the third time. He did not inform the client of this dismissal, and she again learned the case status directly from the court clerk. Frustrated, she eventually hired a new attorney. Cambridge failed to heed requests for return of the client's file, an accounting of her fees, or a return of the unearned advanced fees. State Bar investigators sent him a total of five letters and email messages requesting a response to the complaint the client had filed against him; though he responded four times, requesting extensions of time or promising delivery, he never provided a substantive response to the State Bar. In aggravation, Cambridge committed multiple acts of wrongdoing that significantly harmed his client, had three prior records of discipline, and demonstrated indifference to his wrongdoing by failing to return the client file, account for his services, or return the unearned fees--even after the State Bar began its investigation. Doyle was suspended for 30 days and placed on probation for two years after he stipulated to entering pleas of nolo contendere to two separate alcohol-related traffic offenses: driving under the influence of alcohol with a blood alcohol concentration of .08% or higher (Cal. Veh. Code §23152(b)) and disturbing the peace (Cal. Penal Code §415(1)). In the first incident, Doyle cut off an ambulance, then swerved to block the ambulance when the paramedic driving it tried to get around his vehicle, slamming on his brakes while driving in front of it. When the ambulance was stopped at a red light, Doyle pulled up next to it and mimicked shooting a gun at the paramedics with his finger. They indicated that they were afraid for their own and for others' safety--and would have been unable to respond to a call for assistance while being heckled and threatened by Doyle. In the second matter, Doyle was driving after having dinner and wine when he spotted a neighbor with whom he had a contentious relationship and drove toward him rapidly as the man was attempting to cross the street. He again simulated a weapon with his hand, pointed it at the man, and pretended to pull the trigger. He performed poorly on some of the field sobriety tests officers administered at the scene, where his blood alcohol concentration measured .113% according to a preliminary screening device. The State Bar Court judge determined that the violations did not involve moral turpitude, but did involve misconduct warranting professional discipline. In aggravation, Doyle committed multiple acts of misconduct. In mitigation, he entered into a pretrial stipulation and had practiced law discipline-free for 24 and 28 years before engaging in each of the two acts of misconduct. Dragan was suspended from practicing law for 30 days and placed on probation for one year after he stipulated to committing four acts of professional misconduct in a single client matter: failing to perform legal services with competence, representing three clients with potentially conflicting interests with obtaining their prior written consent, and two counts of failing to promptly respond to a client's reasonable inquiries about the status of a case. Dragan was hired to represent three family members--all of whom had been injured in a car accident--without first obtaining conflict waivers from them. The case was settled with AAA on the day the statute of limitations was set to expire. To expedite the settlement, Dragan agreed to have AAA name the Department of Health Care Services (DHCS) as a payee on the settlement check. It issued a check payable to Dragan, one of the clients, and DHCS. Dragan received the check, but allowed it to lapse; he also allowed a replacement check to lapse. In the meantime, he failed to seek a signature or the proper release from DHCS. He did not return the client's calls and emails sent over several months. The settlement disbursement was delayed for two years. In aggravation, Dragan committed multiple acts of misconduct that significantly harmed his clients and showed indifference to rectification by waiting 18 months after one of the clients filed a State Bar complaint to resolve the matter. Fletcher was suspended from the practice of law pending proof of passing the Multistate Professional Responsibility Exam--one of the terms imposed in an earlier disciplinary order. Golden was suspended from practicing law for one year and placed on probation for three years following an appeal of the hearing judge's decision finding him culpable of 25 counts of professional misconduct related to home loan modification services in 11 client matters. The findings of fact and law were affirmed with minor modifications; the discipline was affirmed. The case is rooted in Golden's challenges to the laws regulating attorneys who perform loan modification services. Those laws were amended in 2009 to provide safeguards for homeowners--adding a requirement that they be advised it is not necessary to hire a third party to negotiate a loan modification and a proscription against charging compensation before completed the promised services. Golden was found culpable of three counts of failing to provide the requisite separate statement about the lack of necessity for third party representation, as well as 11 counts each of charging pre-performance fees and of failing to render appropriate accountings. The fact pattern in all 11 cases was substantially similar: Golden was hired by all 11 clients seeking to keep their homes or properties; he discussed with them available remedies, including loan modifications and litigation--advising them he anticipated litigation if their lenders denied their loan modification applications. All 11 clients signed retainer agreements committing to pay a monthly advance fee; only six of those included the statutorily mandated disclaimer language. Golden submitted loan applications for all but one of the clients, whose application was not fully completed, and negotiated with their lenders. He stipulated that he failed to render appropriate accountings to any of them when his employment terminated--and with one exception, failed to refund any of the advanced fees received. In total, he owed more than $278,000 in restitution. On appeal, Golden argued he offered clients litigation rather than loan medication services--a contention the State Bar Court panel rejected as counter to the statutory language that "plainly prohibits any person engaging in loan modifications from collecting any fees related to such modifications until each and every service contracted for has been completed." Golden also contended that the Homeowner Bill of Rights (A.B 278 and S.B. 900 (2011-12 Reg. Sess.)) should be read to allow a lawyer to get paid for preparing litigation as a means to leverage a loan modification from a client's lender. The panel pointed out that the code clearly prohibits an attorney from charging pre-performance fees; the Homeowner Bill provides that a borrower may receive attorney fees from a lender and does not address the advance fees involved in the instant case--nor does it expressly permit an attorney to charge pre-performance fees. He also argued that the code language, as amended, is ambiguous--a claim the panel rejected outright. In aggravation, Golden committed multiple acts of misconduct that significantly harmed his clients--in two cases overreaching by unilaterally subtracting attorney fees from a settlement check and accepting several months of monthly fee payments after withdrawing from employment. Aggravating weight was also allotted for his failure to make restitution and demonstrated indifference for the consequences of his misconduct, as he continues to operate his law firm in a similar manner to that under scrutiny in the instant case. Finally, additional aggravation credit as "uncharged misconduct" was given to the failure to include the requisite disclaimers in three clients' fee agreements--misconduct to which Golden stipulated earlier. In mitigation, he had practiced law for approximately 17 years without a record of misconduct and cooperated with the State Bar by entering an extensive stipulation as to facts, admissibility of evidence, and culpability. Halpine-Berger was suspended from the practice of law for 60 days and placed on probation for three years after she stipulated to failing to comply with several conditions imposed in an earlier probation order. Specifically, she filed two quarterly written reports and two underlying criminal matter reports late, failed to furnish urine samples and screening reports to the Office of Probation for five months, and failed to file proof of attending abstinence-based self-help meetings as required for four of the months she was on probation. The Office of Probation subsequently filed a motion to revoke her probation. While not specifically identifying them as mitigating facts, the State Bar Court judge pro tem noted that Halpine-Berger had submitted a letter from a therapist asserting that her alcohol-related health problems and attempts to address them contributed to some of her failure to comply with the probation conditions, has registered to take the Multistate Professional Responsibility Examination and enrolled in the State Bar's Ethics School has quit the job as bar manager that she held after being fired from a legal position, submitted declarations from three individuals attesting to her good character, and has cooperated with the Office of Probation in settling the matter at hand. Harris was suspended for two years after a probation revocation proceeding in which the State Bar Court judge found he willfully failed to comply with the conditions imposed in an earlier disciplinary proceeding. He did not file a response to the Office of Probation's motion to revoke. In the earlier proceeding, Harris had stipulated to all underlying facts, conclusions of law, and the disposition; the California Supreme Court then stayed a two-year suspension and instead actually suspended him for six months and placed him on probation for two years. However, Harris failed to comply with his own agreement by not submitting the first three written reports to the Office of Probation when due. In a separate proceeding, with an order taking effect one week earlier, he was also suspended from practicing law pending proof of passing the Multistate Professional Responsibility Examination as required in the terms of a previous disciplinary order. In aggravation, Harris committed multiple acts of misconduct, had a prior record of discipline, and showed indifference to rectifying his own wrongdoing. Harrold was actually suspended for one year and placed on probation for three years following a probation revocation hearing in which the previous stay of suspension was lifted. He did not participate in the proceeding, despite receiving proper legal service. He was found culpable of violating conditions imposed in an earlier discipline order by failing to submit two quarterly written reports to the Office of Probation and submitting another that failed to comply with reporting requirements in that it was not signed or dated. In aggravation, Harrold committed multiple acts of misconduct and had a prior record of discipline, showed indifference to rectifying his misconduct by continuing to fail to comply with his probation conditions, and failed to participate in the instant disciplinary proceeding--reflecting "an ongoing lack of commitment to comply with ethical requirements." Helton was suspended from practicing law pending proof of passing the Multistate Professional Responsibility Examination--one of the conditions imposed in an earlier disciplinary order. Johansen was suspended from the practice of law for 90 days and placed on probation for two years after she stipulated to committing 12 acts of professional misconduct related to two client matters. Her wrongdoing included: failing to inform a client of significant case developments and failing to render a proper accounting of client funds; as well as two counts each of failing to perform legal services with competence, failing to respond to reasonable client inquiries about their cases, failing to promptly release the clients' files after terminating employment, failing to promptly return unearned advanced fees, and failing to cooperate in the State Bar's investigation of the misconduct alleged. In one case, Johansen represented a client in appealing a family law case. The appeal was dismissed twice after extensions of time were granted; Johansen never filed the opening brief. She failed to respond to his repeated status inquires, failed to inform him the appeal had been dismissed, and failed to inform him that his ex-wife had ceased proving weekly employment search reports as agreed; the reports were relevant to child support obligations. She did not return the $9,000 advanced fee. In the second matter, Johansen was hired to help resolve lingering property issues in a dissolution case, accepting $3,000 in two installments. She then failed to complete the necessary pleadings and court filings as agreed--ignoring the client's status inquiries and email messages for more than two years, then equivocated about her actions in the case until he hired new counsel. Johansen received a total of six letters from State Bar investigators--all of which she ignored. In aggravation, Johansen committed multiple acts of misconduct that significantly harmed her clients, had a prior record of discipline, and failed to make restitution to either of the clients. Lipton was suspended from the practice of law for 90 days and placed on probation for two years after he stipulated to committing two acts of professional misconduct in a single client matter: employing a person he knew had been disbarred to provide legal services and aiding another person in the unauthorized practice of law. In the underlying matter, an attorney who had been disbarred recommended that a man with an ongoing marital dissolution case hire Lipton for help. Lipton became the attorney of record, but permitted the disbarred lawyer to negotiate with opposing counsel and appear in court on behalf of the client at two separate hearings. At all times, Lipton was aware the other attorney had been disbarred earlier. In aggravation, Lipton committed multiple acts of misconduct. In mitigation, he entered into a prefiling stipulation and had practiced law for approximately 45 years without a record of discipline. Miele was suspended for 60 days and placed on probation for two years after she stipulated to committing three acts of professional misconduct related to falsifying records and other personal information when applying for a position as an attorney at a law firm. All three offenses involved moral turpitude. A law firm made a job offer to Miele, contingent upon the firm's receipt of her academic transcript from law school. She had submitted a resume indicating she had been in "The Top 20%" of her class. She emailed a copy of her grade transcript instead of asking the school to release it; the email indicated a GPA of 82.92 and class rank as 30/151 when she graduated 25 years ago. About a month after the initial offer, Miele left a voicemail message for the firm's administrative assistant, asking her to delete and disregard the earlier message, explaining she had erroneously sent the firm some her sister's confidential information. In reality, Miele does not have a sister. Shortly after Miele began working at the firm, her official law school transcript arrived there--showing a GPA of 68.27, with no class rank listed. In aggravation, Miele committed multiple acts of wrongdoing and lied in an attempt to conceal her wrongdoing. In mitigation, she entered into a prefiling stipulation, had practiced law for approximately 17 years without a record of discipline, and was given some mitigation credit for extreme emotional difficulties occasioned by her mother's deteriorating health, loss of childcare help, stress from work, and a contested paternity suit in which she was involved. Schultz was suspended from the practice of law for 60 days and placed on probation for two years after he stipulated to committing four acts of professional misconduct related to a single client case. His wrongdoing included: improperly withdrawing from representation, failing to refund unearned advanced fees to a client, failing to render an appropriate accounting of client funds, and failing to cooperate in the State Bar's investigation of the misconduct alleged. In the underlying matter, Schultz was retained to represent a client in a property boundary line dispute with a neighbor. One month after receiving and negotiating the client's advanced fees check, Schultz suffered a medical condition requiring surgery and a hospitalization. His enduring medical condition caused him to stop practicing law. However, Schultz did not communicate with the client about the status of the case or the reality of his physical condition after that, and did not respond to the client's inquiries, messages terminating his representation, or requests for an accounting and refund of unearned fees. After disciplinary charges were filed against him, Schultz requested additional time to respond to them, but ultimately did not. He subsequently enrolled himself on voluntary inactive status. He then provided the State Bar with an accounting of the services he had provided in the case, but did not refund any unearned fees to the client. In aggravation, Schultz committed multiple acts of misconduct and made no restitution to the client he had harmed. In mitigation, he had practiced law for approximately 30 years without a record of discipline and suffered from physical difficulties--though that weight was limited because he failed to disclose the limitations to the client, and due to the fact the condition is ongoing, so there is no indication it would not contribute to future misconduct. Sullivan was suspended from practicing law for 18 months and placed on probation for two years after the appeal of two consolidated cases: a disciplinary proceeding and a conviction referral matter. The State Bar Court judge found by clear and convincing evidence that Sullivan was culpable of all professional misconduct charged in a client matter: failing to obey a court order, failing to report judicial sanctions imposed, committing an act of moral turpitude by submitting an inaccurate report of compliance with Mandatory Continuing Legal Education requirements, and failing to cooperate in the State Bar's investigation of the wrongdoing alleged. He was also found culpable of misconduct warranting professional discipline for a reckless driving condition deemed to involve moral turpitude. After the disciplinary and conviction referral matters were consolidated, Sullivan initially failed to appear for trial. That default was set aside, but on the second day of trial--starting late and including a two-hour lunch break at Sullivan's request--he did not return to court after the lunch break. In the underlying client matter, Sullivan was sanctioned after filing a motion for sanctions in a civil arbitration case; the opposition to the motion noted it "could be better classified as a tantrum than a motion. The judge found the motion was brought for an improper purpose--and sanctioned Sullivan $2,500 for filing it. He neither paid nor reported the sanctions to the State Bar as required. The State Bar Court judge rejected his argument that he did not have to comply with the sanctions order because it was "unfair, not legal, and voidable"--reasoning that the belief of the validity of an order is irrelevant to the charge of violating the statute requiring attorney to obey court orders. In another matter, a State Bar investigator requested a response from Sullivan as to why he had wrongly alleged he had complied with Minimum Continuing Legal Education requirements during an audit. He offered the excuses that he had changed addresses and believed in good faith that he had complied. He also defended he could not comply because he "was busy being a real lawyer, helping real clients, with real problems." In finding the inaccurate report resulted from gross negligence amounting to moral turpitude, the State Bar Court judge underscored: "Such a cavalier and dismissive attitude goes against the aim of continuing legal education, which is 'to provide continuing assurance to the public that all California attorneys, no matter how many years may have passed since their law school graduation and State Bar admission, have the knowledge and skills to provide their clients with high quality legal services.'" In the conviction matter, Sullivan pled nolo contendere to a misdemeanor charge of reckless driving (Cal. Veh. Code §23103). He had been stopped after sideswiping numerous vehicles with his car, but failing to stop at the scene or to inform the owners of the damage and leave his contact information as required. Although Sullivan denied that he had hit any cars or had been drinking, arresting officers observed a partially empty bottle of tequila in his car as well as a physical appearance and affect of drunkenness. At the police station, he refused all tests for alcohol and was belligerent to the officers--calling them "dickheads" as well as other epithets. He later made a claim against the city of Los Angeles for damages and injuries--demanding $1 million for tight handcuffs. $10 million for unlawful assault by the officers, and $50 million for civil rights violations. The judge noted that though reckless driving does not inherently involve moral turpitude, the facts and circumstances surrounding this particular conviction involved moral turpitude warranting professional discipline. In aggravation, Sullivan committed multiple acts of misconduct, significantly harmed the public and the administration of justice, had a prior record of discipline, and demonstrated indifference toward rectification or for atonement of the consequences of his misconduct. Suojanen was suspended from practicing law for six months and placed on probation for three years after he stipulated to committing two counts of professional misconduct related to a single client case: holding himself out as entitled to practice law when he was not entitled to do so and actually practicing law when not entitled--wrongdoing involving moral turpitude. In the underlying matter, Suojanen was earlier placed on involuntary inactive status after failing to affirm his compliance with Minimum Continuing Legal Education requirements with the State Bar. During that time, he was counsel of record in an appellate matter, and attempted to file an opening brief in the case--rejected as nonconforming due to formatting difficulties. The court clerk recommended that he file for an extension of time to file. While Suojanen informed his client a couple weeks after he was placed on inactive status, he did not ever inform the court of that fact. In aggravation, Suojanen committed multiple acts of misconduct and had a prior record of discipline. In mitigation, he entered into a prefiling stipulation. Torgerson was suspended from practicing law in California for 30 days and placed on probation for two years following the professional misconduct findings determined in another jurisdiction. The case was considered in a streamlined, expedited proceeding allowing that a certified copy of a final court order determining that a member of the State Bar of California committed professional misconduct in another jurisdiction is also conclusive evidence of culpability of professional misconduct in California. (Cal. Bus. & Prof Code §6049.1. The only statutory exceptions are if the culpability in the other state would not warrant discipline under the laws and rules in effect here, or that the other proceeding lacked fundamental constitutional protection. Torgerson was admitted to practice in both California and Minnesota. The Minnesota Office of Lawyers Professional Responsibility considered her actions in a number of cases there and concluded she was culpable of professional misconduct including: making false statements, making unfounded accusations against a judge, charging an improper flat fee, disobeying a court order, and behaving belligerently toward a judge and court staff. She was suspended from practicing in that state for 60 days and placed on probation for two years as ordered by the Minnesota Supreme Court. In making its recommendation of professional discipline, the California State Bar judge emphasized: "This court rejects Respondent's attempts to relitigate in this California proceeding the adverse culpability findings in Minnesota." In aggravation, Torgerson committed multiple acts of misconduct and demonstrated a lack of insight into the wrongfulness of her wrongful words and actions. In mitigation, she had practiced law in California discipline-free for 20 years before her misconduct began. She was also allotted limited mitigation credit for letters of apology she wrote to those she abused and harassed, which were characterized as "belated and curt," and for letters from eight individuals attesting to her good character--none of whom were aware of the discipline imposed in Minnesota or the pending disciplinary matter in California. Triance was suspended from the practice of law for one year and placed on probation for one year after a probation revocation hearing in which the State Bar Court judge found, by a preponderance of the evidence, that he had failed to comply with two of the conditions imposed in an earlier probation order. Specifically, he failed to provide a quarterly written report and proof that he paid restitution with the Office of Probation as required. He did not file a response to the motion to revoke probation, which had been properly served upon him. In aggravation, Triance had been disciplined by the State Bar for professional misconduct twice previously, showed indifference to rectifying his wrongdoing by continuing to fail to comply with probation conditions, and demonstrated a lack of cooperation by failing to participate in the State Bar's disciplinary proceeding. White was suspended from the practice of law pending finality of his convictions for attempted grand theft--embezzlement (Cal. Penal Code §§ 664(a) and 487(a)504), grand theft--embezzlement (Cal. Penal Code §487(a)/504, and grand theft by false pretenses (Cal. Penal Code §§ 487(a)). The offenses are misdemeanors involving moral turpitude. Zorr was suspended from practicing law pending her passage of the Multistate Professional Responsibility Exam as mandated by the California Supreme Court in an earlier disciplinary order. Uchiyama was placed on probation for two years after she stipulated to committing two acts of professional misconduct: willfully disobeying a court order and failing to report the judicial sanctions imposed against her. Uchiyama represented a plaintiff in a superior court action. She filed a response to the defendants' motion to strike the complaint one day late; the response also exceeded the page limit. After Uchiyama obtained a stay of the first order granting the motion to strike, the court issued a second order requiring her to file a new opposition and to pay attorney's fees and costs of $6,162.50 and an additional $1,000 to the State Bar Client Security Fund. Uchiyama failed to pay the sanctions by the date due, but did make the payments several months later, after the court referred the matter to the State Bar. She had not reported the sanctions on her own. In aggravation, Uchiyama committed multiple acts of misconduct and had a prior record of discipline. In mitigation, she entered into a pretrial stipulation acknowledging her misconduct and provided 13 letters from members of the legal and general communities--all of whom attested to her good moral character and legal ability. Stone-Molloy was publicly reproved after he stipulated to committing two acts of professional misconduct in a single client matter: failing to support the laws and constitution and advising a client to violated the law. In the underlying matter, Stone-Molloy, his wife, and her three siblings suspected that his father-in-law had suffered elder abuse at the hands of a companion. After being informed that the father-in-law had died unexpectedly, Stone-Molloy advised his wife and her siblings to surreptitiously record the companion in the hope of collecting evidence of the abuse. Their conversation was recorded; the companion had not given prior consent to the recording. In mitigation, Stone-Molloy entered into a prefiling stipulation, had practiced law for 13 years without a record of discipline, and was afforded some mitigation credit for the emotional distress suffered due to the death of his father-in-law, with whom he had a very close relationship. Tran was publicly reproved after she stipulated to pleading no contest to unlawfully driving a vehicle with a blood alcohol content of .08% or higher (Cal. Veh. Code §23152(b)). In the early morning hours, highway patrol officers stopped her after observing her speeding and weaving on the freeway. Tran's arrest for that offense occurred when she had five days remaining on her probation for a prior DUI. The State Bar Court judge determined that the facts and circumstances surrounding the offense did not involve moral turpitude, but did involve other misconduct warranting professional discipline. In aggravation, Tran caused significant harm to the administration of justice by driving under the influence while employed as a deputy district attorney. In mitigation, she entered into a pretrial stipulation and expressed deep remorse for her misconduct--also taking substantial and sustained steps to address her alcohol addiction and has remained sober for several years. She was also given some mitigating weight for practicing law without discipline for approximately 6 1/2 years at the time of her second offense--the weight of that diminished by her prior DUI conviction.